"Luke 15:10 In the same way, I tell you, there is rejoicing in the presence of the angels of God over one sinner who repents"
"The most popular carburetor used on motorcycles is a variable venturi carburetor"
This website is about the small engine, small engine products, small engine maintenance and repair, and all supporting technologies found in the outdoor power sports and outdoor power equipment industries. Everyone is invited to participate. Take a look at the small engine shop forum where you can ask questions or find answers to problems, or use any of the other resourses on this website. So what is a small engine? A small engine is an internal combustion engine that varies in physical size or displacement from 30cc (cubic centimeters) up to 1800cc. There really is no set displacement range for defining a small engine, but they usually fall somewhere within that range. Small engine's are commonly found in outdoor power equipment and outdoor power sports. This can include everything from lawn mowers, blowers, weed eaters, portable generators, lawn tractors, garden tractors, chainsaws, motorcycles, jet skies, ATV and side by side vehicles. Some less common vehicles that use a small engine, or have in the past, might include cars, fork lifts, smaller vehicles found on farms, etc. A small engine can use four stroke, two stroke or diesel technology. A small engine can be carbureted or fuel injected, and a small engine can burn alternative fuels. Horse power ratings for a small engine can very greatly depending on the engine displacement and applcation. It is not uncommon to have two similar engines with similar displacement, but one produces several times more horse power than the other; it all depends on the application. A lawn mower engine designed to be reliable and spend its life running at 3600 rpm has different performance requirements than a engine designed to rocket a motorcycle around a dirt track, even though both engines have similar displacement. 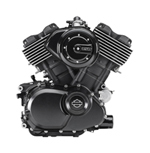 A motorcycle engine is required to operate over a broader rpm range and produce more horse power per unit of displacement than an industrial engine. A Briggs & Stratton engine that produces 25 HP is approximately 700cc in size, but a motorcycle engine with the same displacement can produce 70 HP or more. In 2015 Kawasaki manufactured a 998cc supersport Ninja H2R that produces a whopping 300 HP. Kawasaki's H2R engine is only 298cc larger than the 700cc Brigg & Stratton engine, but the H2R produces 12 times the horse power. Most, if not all, content on this website, blog and forum will be for small engine's found in the outdoor power equipment and outdoor power sports industries. Feel free to contact thesmallengineshop.net using the website contact page. Ask all technical questions in the forum if forum registration is open, so others can benefit from the question and answer thread.